Wash and soak glutinous rice for several hours or preferably overnight. Drain well in a colander and stir in alkaline water and oil in a bowl. Leave aside to marinate for 2 hours. 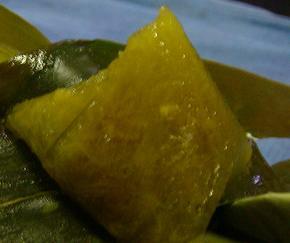 To wrap the dumpling: Take 2 piece of bamboo leaves, overlap and fold into a cone shape. Fill with a tablespoon of glutinous rice and wrap into a cone. Secure with hempstring. Bring a large pot of water to a boil and put in the bundles of dumplings, making sure that they are covered with water. Boil for 3-4 hours or until dumplings are cooked thoroughly. Add additional water in the process of cooking should the water dry up. Remove dumplings and hang up to dry. Serve alkaline dumplings with pandan-flavoured kaya and some freshly grated coconut with an addition of a little salt added to the grated coconut.